This addon was available for purchase but was also a free online download too. 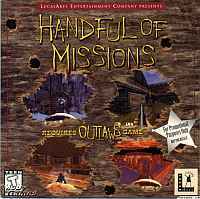 It has four single and five multiplayer missions but requires a retail version of Outlaws. It's set in a time period years before Outlaws when a young James Anderson is serving as a government agent and receiving assignments from the attorney general. His single player missions are set in a Missouri wharf town, Spanish villa, and icy caves of the Rocky Mountains, where he has to capture leaders of the gangs. One of the missions is infiltrating behind enemy lines during the Civil War. Multiplayers levels are set in towns with great number of places to hide.